Beachgoers in Argentina plucked a small, rare dolphin from the beach to photograph it until the dolphin overheated and died. Consider it a new low for selfies. 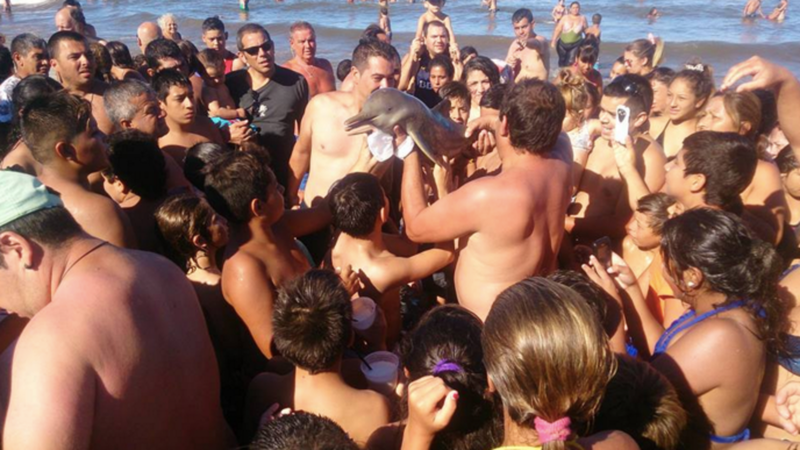 The dolphin was apparently passed around by a crowd of people and passed along for selfie purposes. Its carcass was left on the shore. A man named Hernan Coria posted photos of the incident on his Facebook page, commenting in Spanish that this was the second dolphin people saw on the beach that day, and saying that he didn't think this one made it out of the crowd alive (no word on what happened to that first dolphin). His post has been shared more than 2,600 times so far, and has elicited a number of very angry comments. The International Union for Conservation of Nature, or the IUCN, lists the Franciscan dolphin as a vulnerable species because analysis shows that the population of this type of dolphin has declined by roughly 30% over a period of 36 years. Now, there are only about 30,000 Franciscan dolphins left in the world. According to the IUCN, "The rate of decline is probably underestimated because a period of only 25 years was considered and other sources of non-natural mortality were not incorporated into the analysis." Now the IUCN will have to add selfies to these non-natural mortality outliers. The Argentine Wildlife Foundation responded to the death by reminding people to return animals to their natural habitats. The Franciscana, like other species, cannot remain for much time outside of the water, it has thick fatty skin which gives it heat and means that taking it out of the water rapidly causes it to dehydrate and die…This occasion serves to inform the public about the urgent necessity to return these dolphins to the sea as soon as possible if they find them on the shore. A PETA spokesperson told Metro that the death was an outrage, stating: "In their efforts to get a novelty 'selfie', these holidaymakers showed a naïve–and ultimately fatal–disregard for life by hauling this baby dolphin out of the sea, where he or she belonged…One can only imagine the trauma suffered not only by this baby, who was passed around like a toy by marauding tourists, but also his or her grieving mother."